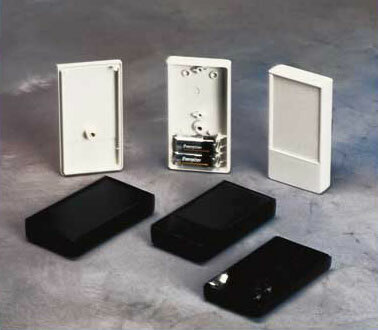 Small pocket-boxes are durable and versatile units with a high sealing capacity. Cases feature a recessed control area for membrane keyboards. Two screw pillars prepared for mounting PCBs in the base and an integrated battery compartment for two 1.5V AAA cells. Black Infra-red versions permeable to Infra-red signals available. Enclosure is snapped in at the front and secured by one M3 screw. ABS (UL 94 HB) and PMMA (plexiglass®), permeable to Infra-red light. Also available in other materials on request. 3.3 x 1.8 x 0.6"